'Maison Olivier ' is simply and elegantly decorated with classical and provencal furnishings. From the living room there is a beautiful view of the “Mont Ventoux” and the East vineyard. The kitchen opens on to a private stone patio and a Mediterranean herb and flower garden with flowering laurel bushes, thyme, rosemary and lavender. An arbor covered in honeysuckle and jasmine shades a sitting area next to the outdoor dining table and barbecue. There is an open-space kitchen and living room with fireplace. Three bedrooms with ensuite bath/shower rooms. Quality linens, bath towels and pool towels are furnished. In the “pool area”, there is a very large floodlit swimming pool with a sliding semi-telescopic removable cover, sun beds and a covered sitting area. At poolside there are fig trees that provide shade. The pool is in a separate walled in area with a separate shower and toilet. Laudun has a provencal market on Sunday mornings as well cafés, bakeries, and shops. The Domaine des Charmettes is set a Provencal landscape of rock-walled flower gardens filled with Mediterranean plants, roses, lavender, basil, and rosemary framed by olive trees, old parasol pine and cypress trees. An elegant 19th century vineyard made up of 3 houses and numerous outbuildings surrounded by 1 hectare of vines and 1 hectare of gardens and woods. We make and bottle our own red and rosé wine. Situated in a quiet area at the edge of the village of Laudun, the Domaine is a wonderful vacation spot, a quiet haven of tranquility on the Western edge of Provence. Laudun is just south of Bagnols sur ceze in the northern part of the Languedoc Roussillon region. The village is well known for gallo-roman ruins and famous for its “Côtes du Rhône Village wines. In the “pool area”, there is a very large enclosed swimming pool with sun beds and garden furniture The covered sitting area is a perfect place to sit back with a cup of coffee or a glass of wine and just relax. Ideal place for couples and families who want to enjoy the 'sunny life' of Provence and Southern France. The 'Domaine' is extremely well situated for day trips in and around the region. Laudun is centrally located for trips to Chateauneauf du Pape, Avignon, Pont du Gard, Nimes, Uzès, the Ceze Valley, and the 'Gorges de l'Ardeche'. The Mediterranean and its wonderful beaches are just over an hour's drive. There is a separate toilet off the living area. Quality bath and pool towels are provided. Each bathroom is equipped with a hair dryer. 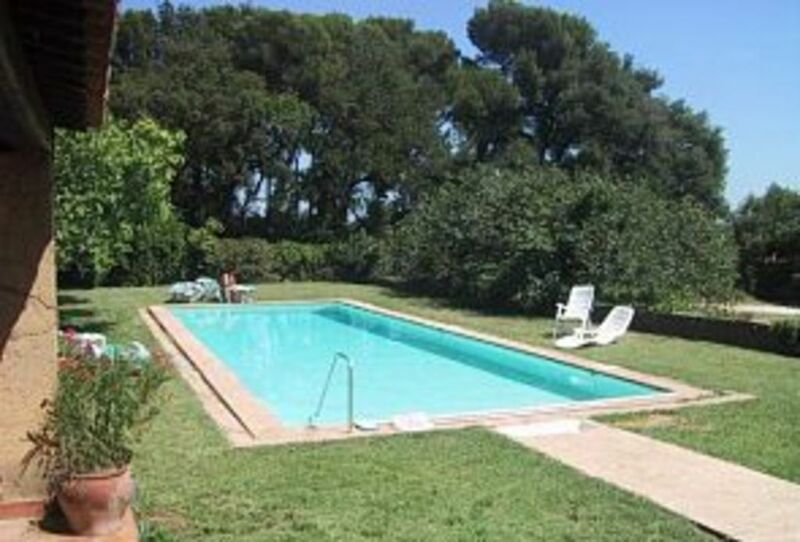 The large swimming pool is equipped with a semi-telescopic cover for solar heating and swimming between seasons. In and around the region we recommend visiting the Pont du Gard, Aviginon, the famous bridge and the Pope's Palace, Chateauneuf du Pape, Roman Theatre in Orange with Choregies, Nimes, the “Ardeche Gorges”, the Valley of the Ceze with medieval villages and castles, and the Mediterranean beaches. organic grapes and pool. In small town 30 minutes from Avignon or Orange. A good location as a base for exploring northern Provence. We were extremely happy with the accommodation provided by Laura. Very private outdoor area with comfortable chairs and table for eating at. Three large bedrooms all with ensuite bathrooms and good beds. The living room was also a good size, and kitchen/dining area also great. Two couples had lots of room, and everything was on one floor. Couldn't have asked for more, and with Laura's hospitality, it was just that little bit better. We found this property at the last minute and were pleasantly surprised by the spacious layout, the kitchen, and outside barbeque and patio. It was easy to relax in the space (we stayed in the three-bedroom rental), and the owners were very friendly and helpful. The owners make their own wine, honey and jam, and also keep a few chickens and goats. Even though the vacation rentals are on the same property as the owners' home, the vacation rentals feel private. We had a wonderful time in this fantastic villa in the middle of a private vineyard. Laura and Thierry were lovely and very helpful and welcomed us with some of their own wine which was fantastic. They also "dressed" us a bottle or Rose for our daughter. We made very good friends with Laya their dog who always came to welcome us when we arrived back from a day of exploring. We loved the pool area and spent several evenings at the pool admiring the view although we also loved our own patio. We ate in most nights preferring to barbecue and there were 2 supermarkets nearby for our needs. We did eat out in Orange which had a good variety of restaurants to choose from. There was lots to do in the surrounding area. We visited Avignon, Pont du Gard, Chateauneuf du Pape and went kayacking in the Ardeche. We also managed a trip to watch the start of the 15th stage of the Tour de France which was great. The property was very comfortable; comfy beds and ceiling fans made sleeping easy in the high temperatures. The whole villa was clean and very well equipped. I would definitely recommend this villa. You need a car but it is easily reached from Nimes or Bezzier (cheap flights from UK by Ryanair). Thank you laura and Thierry for a wonderful stay! Laura thank you so much for letting us stay in your beautiful Maison Olivier in sunny Laudun. Really it was more than we had hoped for. Very well put together and maintained house that made all 6 of us feel very comfortable. The ensuite bathrooms, full kitchen and spare fridge certainly helped that! Also the lovely view of the vineyard made being inside almost as nice as being outside. Only almost since our favourite place was definitely the pool. So nice that it had a covered tile area for our baby to keep out of the sun. Thank you again. Our family really enjoyed our time there. Laudun is located 8 kms south of Bagnols sur ceze in the northern part of the Languedoc Roussillon region. The village is well know for gallo-roman ruins and famous for its “Côtes du Rhône Village wines. In and around the region we recommend visiting the Pont du Gard, Aviginon, Orange, Chateauneuf du Pape, Nimes, the “Ardeche Gorges”, the Valley of the Ceze, and the Mediterranean beaches (70 kms). Please note that by using the BOOK NOW feature additional fees of extra fees are generated by Home Away for credit card use and processing fees. These fees will be included in the final invoice. A 30% deposit must be paid in Euros at the time of the booking. The balance is due 60 days prior to arrival at the house. A guarantee deposit of 300€ must be paid in cash upon arrival. The end of stay cleaning fee +the tourist tax must be paid in cash before your departure. Linens are included. Linens are changed and the cleaning done once a week, if renting for more than one week.